Here's everything you need to know about Wi-Fi tethering. Using my phone as a hotspot (also known as Wi-Fi tethering) means that whenever I have a couple of bars of signal strength, I can get my tablet or laptop online — and share my internet connection with work colleagues. It’s my way to stay on top of work wherever I am, allowing me to read and send emails, move data back and forth with the company’s servers and even get a taste of the latest office gossip from the comfort of a full-sized device. A phone hotspot can be a serious collaboration tool for a group of business people attempting to work together. The potential ranges from a group on the way to the airport in a van finishing a group presentation to an accounting team working in a conference room with an internet connection independent of the company they’re auditing. It works just like a dedicated mobile hotspot, but because it’s inside your phone, there’s nothing extra to charge, carry, and try not to lose. When the phone is connected to the mobile data network, it can convert the data stream into a Wi-Fi signal for other devices to share. Happily, the phone can still view web sites on its screen, make calls and respond to texts while it’s hosting the connection. This technique works with most current Android and iOS phones, and using your phone as a hotspot can be more secure than using a public hotspot. The usage is generally included in your monthly plan, but only up to a specified limit for most plans. On the downside, using your phone as a hotspot can chew through your phone’s battery very quickly. After talking to representatives of phone makers and networks about their products and using my Samsung Galaxy Note 8 as a hotspot on several field trips, I’ve answered 15 key questions about Wi-Fi hotspotting to make life easier on the road. 1. What is a phone Wi-Fi hotspot? 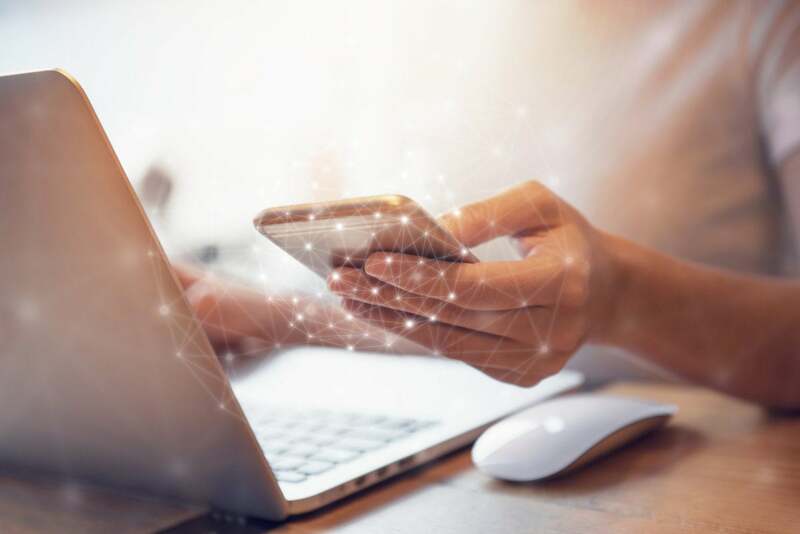 At its essence, a hotspot is a blend of software, hardware and network data services that combine to transform a phone into the equivalent of a broadband modem and router. In other words, it can distribute a web connection to nearby systems via Wi-Fi. This not only lets me get my laptop and tablet online, but I can share it with co-workers, as long as they’re in range and they know the password. Some phones also allow tethering via Bluetooth and USB cables, but these techniques are less popular. 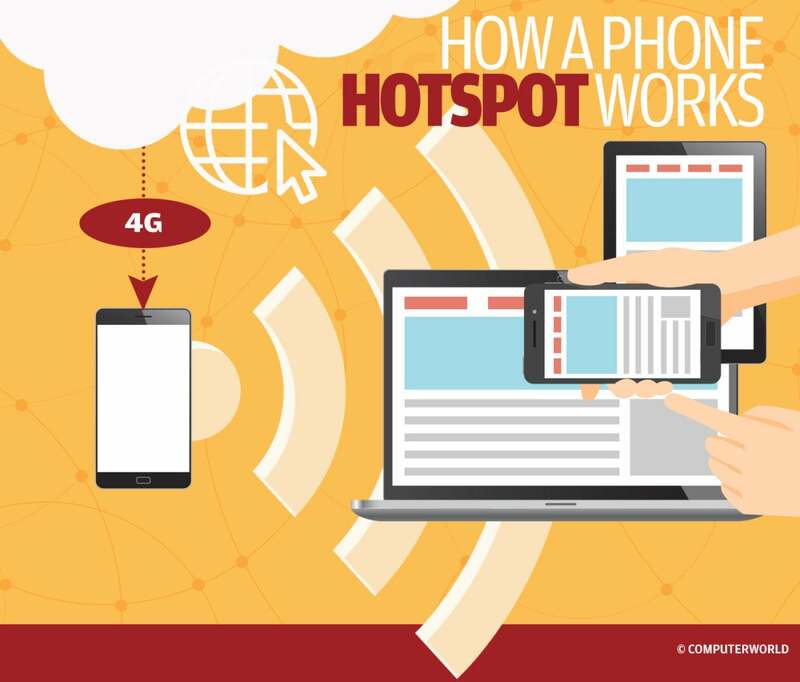 To use a phone as a hotspot, the device treats its online connection to the data network as if it were a broadband data source. It then transmits this data locally like a mini-Wi-Fi router using the 802.11ac protocol. The net result is that those Wi-Fi devices that are within range can tap into the data signal as if it were a regular old Wi-Fi network — because it is. 3. How secure is using a phone hotspot? Using a phone hotspot can increase your security profile by letting you avoid the use of insecure public hotspots in coffee shops and hotels. At the phone end of the equation, it’s just as secure and private as making a phone call or web surfing with your phone, because LTE data traffic is generally encrypted using the Snow Stream cipher. If that’s not enough for your company’s security stance, a VPN can build a stronger wall around your communications with AES 256-bit encryption. It often comes at the cost of performance, though. Between the phone and the clients connecting through it, the phone’s hotspot uses WPA2 encryption, which requires a passcode of at least eight characters. 4. Which phones and networks support Wi-Fi tethering? The good news is that just about every Android or iOS phone on the market can be turned into a Wi-Fi hotspot, but you’ll need to make sure your mobile plan supports it. Most of the business plans and many of the consumer plans from the Big Four national networks include hotspot use in one way or another (see the next question). The bad news is that while your talk-time and texting might be theoretically unlimited, the networks typically limit hotspot access to a maximum of 10GB to 15GB a month at full speed. 5. How much does it cost to use a phone as a Wi-Fi hotspot? These days hotspot use is typically included in certain business and consumer plans rather than offered as an add-on service. While you can expect these plans to change as the networks jockey for position, here’s a rundown of what each of the Big Four national networks offers at the moment. AT&T: The Business Unlimited Plus Basic and Enhanced plans both include 15GB of hotspot data at full LTE speed per month. After that, broadband speeds drop to 128Kbps. Pricing starts at $80 per line. On the consumer side, the Unlimited Plus Enhanced plan starts at $80 per line and includes 15GB of full-speed mobile hotspot data, after which speeds drop to 128Kbps. Some of the company’s Mobile Share Flex plans and prepaid plans also include mobile hotspot capability with a range of pricing and data limits; see their web pages for details. Sprint: The Unlimited for Business plan comes with 10GB of hotspot data at full LTE speed; pricing starts at $55 a line. Once you’ve reached the hotspot data limit, the network slows downloads to 32Kbps, which should be the bare minimum for email. The company’s Unlimited Freedom consumer plan, which starts at $60 per line, includes 10GB of data for mobile hotspot, VPN and P2P use. When that limit is reached, customers are charged $10 for an additional 10GB. The company offers other plans that include mobile hotspot capabilities as well; see the site for details. T-Mobile: The T-Mobile ONE plan for business is similar to Verizon’s Go Unlimited plan in that it lets you use your phone as a hotspot for as long as you like, but it’s limited to 3G speeds. The ONE Plus plan includes 10GB of hotspot data at LTE speeds, then reverts to 3G speeds. Pricing starts at $60 per line for two lines, with ONE Plus adding $10 a month per line. Similarly, the consumer T-Mobile ONE plan includes unlimited mobile hotspotting at 3G speeds, while the ONE Plus plan allows 10GB of LTE hotspot data, then reverts to 3G speeds. Prices start at $70 per line for ONE, and ONE Plus costs an extra $10 per line. T-Mobile’s prepaid and family plans offer mobile hotspot capabilities as well; see the site for details. Verizon: This carrier’s three commercial plans differ slightly as to their hotspot potential. While the Business Unlimited plan includes 10GB of LTE-speed hotspot data and reduces the flow to 600Kbps after that threshold has been reached, the Beyond Unlimited plan provides 15GB before it slows things down. By contrast, if 600Kbps is enough bandwidth for your work, the Go Unlimited plan is like T-Mobile’s ONE plan by including truly unlimited hotspot use at that speed. Pricing for these business plans starts at $40 per line for four lines. Verizon’s consumer options are similar: The Beyond Unlimited plan includes 15GB of mobile hotspot use, then slows speeds down to 600Kpbs, while the Go Unlimited plan provides unlimited mobile hotspot use at 600Kbps. Pricing starts at $75 per line. The company’s $75 prepaid unlimited plan also includes unlimited hotspot use at 600Kbps. 6. What kind of devices can connect to a phone hotspot? A phone hotspot can work with any Wi-Fi-based device, including laptops, tablets, other phones, and even game consoles. (We don’t judge what you do in your off-hours.) Think of it as just another Wi-Fi source, only it comes from your phone. 7. How many devices can connect to a phone hotspot? Most Android phones can connect up to 10 users at a time. iPhones are a little different, with iPhone 4 models allowing three connections on the AT&T network or five on Verizon. From the 4S model to today’s iPhone X, they can accommodate up to five client connections. Some mobile plans impose their own limitations on the number of devices that can connect simultaneously. Of course, the more users sharing the internet throughput, the lower the speed for each client. 8. Where can I use a hotspot? Using a hotspot is not limited by where you are, as long as your phone is connected your service provider’s data network. In fact, any place where you have a signal strong enough to use the web on your phone, you can generally use it as a hotspot with favorable results. I've used phone hotspots in my home, my office, on trains, in hotel lobbies and in coffee shops throughout the U.S. as well as in Europe and Asia. There’s a big bonus as well if your office’s data connection goes south. When my office’s internet connection went dead for five hours recently, I used my Galaxy Note 8’s hotspot abilities to keep my office up and running. It wasn’t as fast as I’m used to, but it kept the emails and data exchanges flowing. The key was configuring the hotspot with the network’s name and passcode. 9. Is the setup hard to do? Not at all. In fact, it’s one of the easiest configuration changes you can make. It’s different for iPhones and Androids but should take no more than a minute or two. A word of advice: For security purposes, be sure to set the network name and password. Start on the Home screen and tap the Settings icon. Open the Personal Hotspot section. Tap the slider switch to turn on the hotspot. The network name will be the same as the name of your device. (To change it, go to Settings > General > About > Name.) Hit Wi-Fi Password to change the password you want to use. It’s a little trickier giving instructions for Android phones, because they vary by phone manufacturer and Android version. I’ve included instructions for my Galaxy Note 8 using Android 7.1.1 (Nougat), but depending on its software and network, your phone might be slightly different. Swipe the Home screen up or down to bring up the apps and open Settings. On my Note 8, I tap Connections, then scroll down and tap Mobile Hotspot and Tethering, and then tap Mobile Hotspot to enable it. 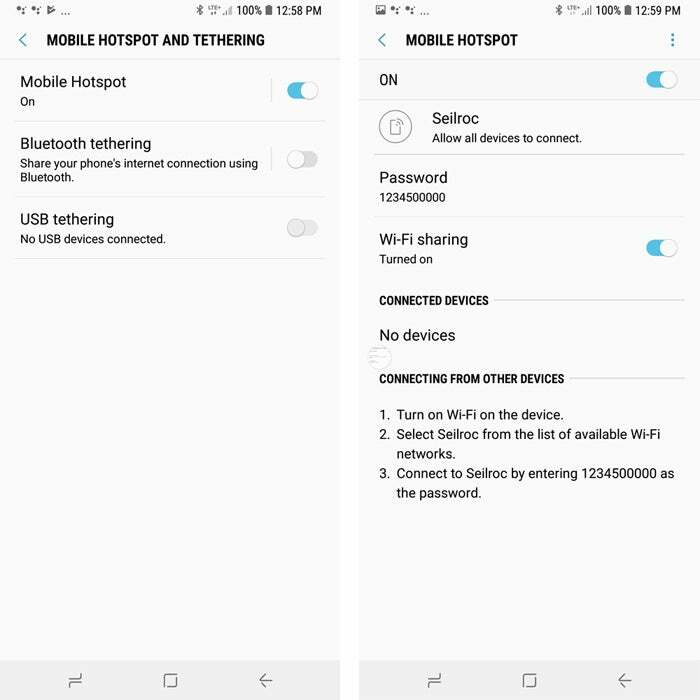 Depending on your software, your menu wording might be different (such as “Wireless & networks” instead of “Connections”), and you might need to tap “More” to find the tethering and hotspot option. Tap on Password and the current network name near the top to update the network name and password. Setting up a mobile hotspot with a Galaxy Note 8 running Android Nougat. This password desperately needs to be changed. Once you’ve enabled the hotspot, it will be discoverable by devices searching for Wi-Fi networks in the vicinity, but only users you’ve shared the password with can connect. Open the Wi-Fi settings for your laptop or tablet and look for your new network. After you enter the password, the systems should link up in less than a minute. So you’re not trailing a Wi-Fi signal wherever you go, it’s a good idea to turn the hotspot tethering off as soon as you’re done. Your battery will thank you as well. 10. How does using a hotspot affect battery life? Speaking of battery life, turning on the hotspot abilities of your phone is like firing up a micro router, which seriously cuts back on its battery life. For example, while my Note 8 has a battery life expectancy of 10 hours, it lasted for just 7 hours, 20 minutes of continuous hotspot use with two devices connected. It’s best used for brief spells unless you can power your phone with an external battery or an AC outlet. 11. What speed and range can I expect? All four mobile data networks in the U.S. use 4G LTE equipment with fiber-optic data backbones. The actual results depend on lots of factors, including how congested the internet is, how far you are from a closest cell tower and how many other people are using that cell site. Over the years, I’ve gotten everything from measly 20Kbps (enough for email and basic use) to 80Mbps (plenty for HD video or downloading a large presentation). A phone hotspot can’t compare to a traditional router in terms of range. Still, you can expect to create a 25- to 50-foot zone of connectivity. This should be plenty for personal use or for a small group in a hotel room or huddling around a conference room table.